Heat Printing or Screen Printing- Which is a Better Option? 3 Heat Printing or Screen Printing- Which is a Better Option? Those days are gone when printing a copy of a book or a newspaper would take days. The printing industry has come a very long way. Due to rapid advancements in the technology, faster and more efficient devices are introduced to make printing more flexible and simpler than ever before. Screen printers and heat press machines are the most recent innovations in the printing industry. In the heat printing process, you start by printing or cutting your design on a special transfer paper using a specialty ink. Then the design is then transferred to your garment by pressing it under a heat press machine. A heat press is a device that presses your artwork into substrates such as t-shirts, mugs, caps, etc. The device employs a high amount of heat and massive pressure to permanently embed the design into your substrate. The machine typically requires around 350°F to 400°F and a pressure setting of 40 to 80 psi. The heat transfer printing method is one of the most popular printing processes in the textile industry today. With this method, you can print high-precision, full-color graphics on your garments. 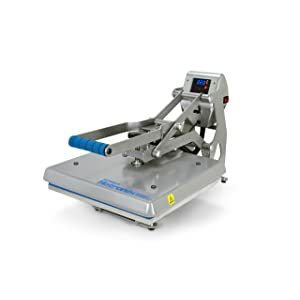 With the improving technology, heat press machines have become easy to setup and use. There are various different sources and types of transfers. A standard transfer consists of a carrier paper and inks. When heat and pressure are applied to the transfer paper, the inks are transferred to the substrate you are heat printing on. The heat applied material or the transfer features a highly heat-sensitive adhesive on one side to make the material adhere effectively to the substrate when heat is applied to it. Vinyl transfers are mostly used for this purpose. In some tropical transfer, the image is applied on the surface of the material, while there is ink sublimation transfer where the ink on the printed transfer is permanently absorbed into fibers of the substrate you are printing on. Use of precisely formulated inks and advances in software packages and graphics provide greater control and flexibility to the operator, resulting in better quality outcomes. The colors don’t overlap even when multiple colors are used or layered on one another. Heat printing is inexpensive and ideal for those who run a small printing business and great for home use. It can also be used for transferring photographic images. The machine used is simple, and the whole process is easy and quick. Heat printing is a clean and environmentally safe process, which is why it has gained much popularity in today’s safety and health conscious work environments. Results may not be very satisfying for dark-color substrates. If you are working on a lot of garments, it can be expensive and as well as time-consuming. Layering the colors can make your garment feel bulky. The print will be stiff. The print may start fading after a few washes, and it may not last for long. In most transfers, the print doesn’t breathe well and will provoke sweating. The print can’t be ironed. 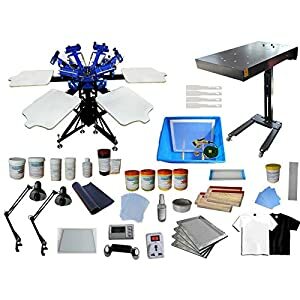 Screen printing is the most popular technique of printing on various items, including fabrics, t-shirts, pens, bottles, wood, business cards, bags, hats, mugs, and so much more. It’s a traditional method in which an ink-blocking stencil is applied to a woven mesh. The stencil then creates an open area within which ink or any other element that you are using is transferred and printed onto the substrate. Screen printing was actually invented by the Chinese, and they initially used silk screens for the task, which is the sole reason why screen printing is often referred to as silk screen printing. Unlike heat transfer, screen printing is a bit complex process and requires more chemicals and materials. For instance, you will need an emulsion to create a screen, and three other products, including ink thinner, emulsion remover and de-haze for cleaning the screen after use. In this process artwork or design is separated into its constituent colors, and then screens are burned with all the assorted color. As the different colors must be aligned perfectly, the artwork depends on the number of screens that a particular printing machine can hold. Most of the screen printing machines have the capacity of six screens, hence limiting the printing of images up to six colors. The prints have a softer feel as compared to the prints done by heat printing. Produces a bright and satisfactory print, even on dark-color fabric. An ideal process for larger artworks that consist of one or two colors. Excellent for printing onto Poly-cotton or cotton garments. Screen printed garments can withstand the harshness of a washing machine as the heat is dry. The print won’t be damaged easily. Cost effective method for larger production. There are no size limitations for screen printing. All over prints can be done perfectly. Whether you are printing on one garment or numerous garments, the setup time for screen printing is always the same. This is not a very good option if your artwork comprises of several colors. Each color is applied individually, so with every additional color, the making cost also increases. Separate screens are needed for each color. So, for every additional color, a new screen must be used. The more the colors, the longer will be the turnaround time. Screen printing can’t be done on coated fabrics. It is quite time-consuming to set up the whole process and clean. Screens must be stored only in dark rooms. Heat printing is pretty much convenient and the level of detail and precision is better than screen print as transfer prints don’t have any color limit and you can print all types of images with any number of colors. The number of colors used in screen printing is limited as the printing machines have a limited number of screens. The costs involved in heat transfer are minimal. For small quantities of garments, heat transfer printing is a cheaper option. However, for projects with larger numbers, screen printing becomes much cheaper. In heat printing, it takes very less time for setup. After the printing is done, no clean-up is necessary, unlike in screen printing. Heat transfer printing may sound easier, but the whole process is time-consuming as each print requires at least two to three minutes for producing. With heat printing, you will have to go through printing or cutting and weeding of the design for each product. So if you have a huge project then the whole process can be very lengthy. The initial setup of screen printing may take a little longer, but after the setup, each item can be printed in just a few seconds. Heat printing and Screen printing are both printing processes, but there is nothing in common between the two. Both processes are completely different from each other, and they have their own set benefits and limitations. If you are interested in the business of producing t-shirts or other huge printing industries, then screen printing method may be the best option for you. But, if you are a hobbyist or into a small home business, then heat transfer printing may be a better and cheaper option.